A detailed view of the intricate mosaic work on the iconic Dome of the Rock in Jerusalem. This canvas print is a reproduction of an original pencil drawing. Shehab was born on Chain Street in the Old City of Jerusalem and enrolled at the Artists’ House in Jerusalem at the age of 17. He also studied art in Austria and France. 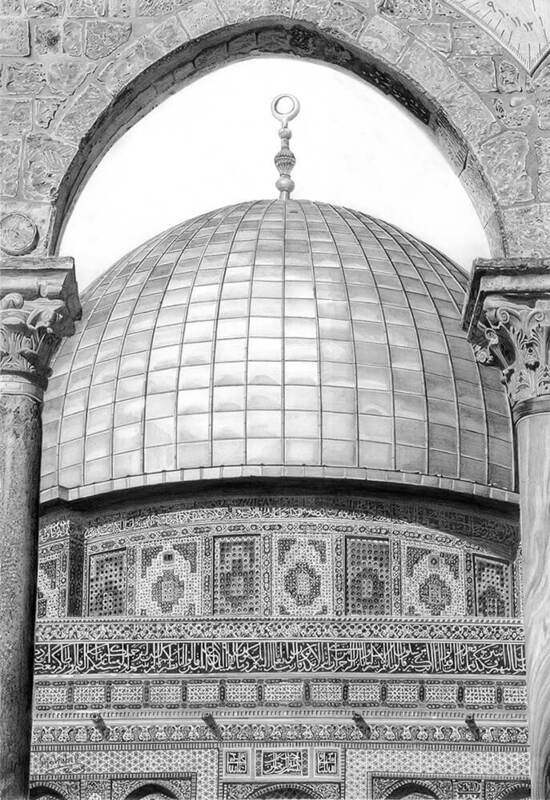 In 1984 he started a project to record images of the streets, alleys and landmarks of Jerusalem in past times. Using ancient photographs or prints, he takes us back in time to key sites and daily life in the Old City in an attempt to narrate and document a forgotten past. Shehab’s pictures stand out for their minute detail and his ability to use various shades of grey like a musical mosaic. In recent years he has added vistas of the modern Jerusalem skyline to his collection.